Indonesia is one of the most beautiful countries in Asia with an amazing culture, plus it is a rather affordable destination. If you book the Los Angeles to Jakarta airfare for $741 r/t – including taxes – our deal hunters just found you can save over $80 in comparison to other similar deals. Fly with Korean Air in February 2015 and spend an amazing week in Asia. You can book this fare both on Faregeek and Cheapoair but note that we have found it on Travelgrove. Yet, if you check some more merchants you may find an even cheaper flight to Indonesia. Start your trip to Jakarta from Los Angeles International Airport (LAX) on February 3 and returns from Soekarno – Hatta International Airport (CGK) on February 10. There is a 1 hour 40 minutes stop in Seoul on the way to Indonesia and an 8 hour 5 minutes one during the return flight. Korean Air Skypass will give you 18,494 extra miles if you book this fare. This amount is more than 25% of a free flight from Asia to the US. 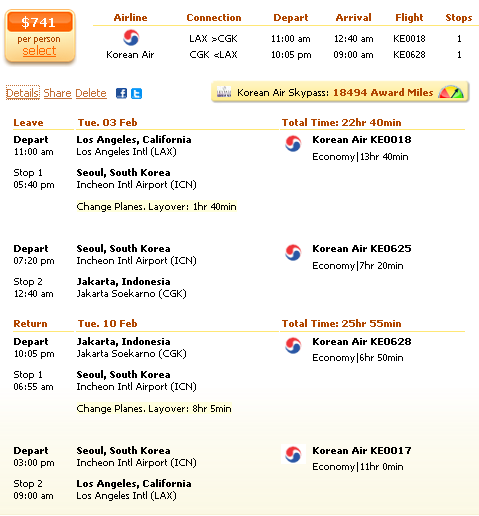 The cheapest flight we have found for the LA to Jakarta route is the Korean Air for $741 r/t. The next best flight costs $806 r/t and is operated by Eva Air, as you can see it in the table. This entry was posted on Sunday, November 23rd, 2014 at 3:05 pm and is filed under Airfare Deals. You can follow any responses to this entry through the RSS 2.0 feed. You can leave a response, or trackback from your own site.